If the purpose of Catfé Lounge in Ferndale is at first unclear, the cat(s) sunbathing on the other side of the window will probably give it away. Nestled in a slim building on Livernois, it’s the public face of Ferndale Cat Shelter, a 501(c)(3) nonprofit that often cares for dozens of cats and kittens at a time — as of early October, 31 active fosters were helping FCS provide refuge to roughly 140 cats. Buttressing those foster homes is Catfé Lounge’s 1,000-square-foot space, which permanently houses a rotating bunch of about 10 felines, all available for adoption, who roam as they please — as long as they’re healthy and play nicely with others. 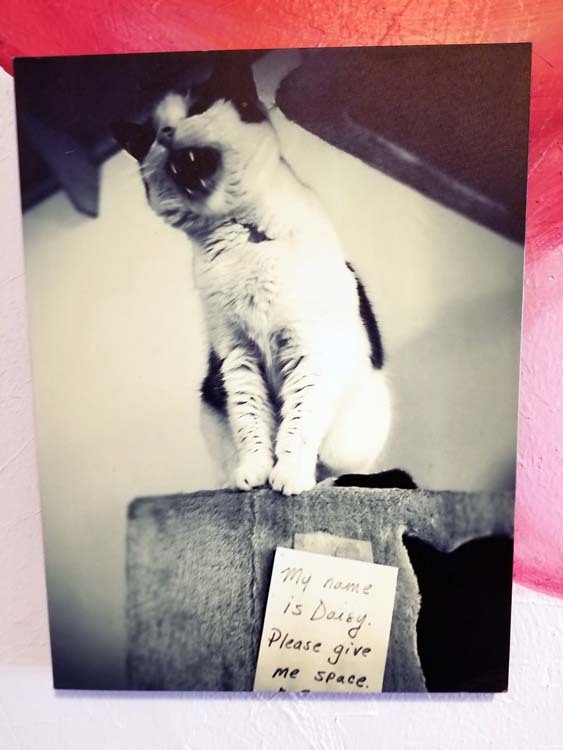 For a suggested $10 donation, anyone can wander in, sign a waiver (most of the cats aren’t declawed, and adopting one means agreeing never to do so), and enjoy some kitty cuddles, selfies, coffee, Wi-Fi, and friendly chats with volunteers. 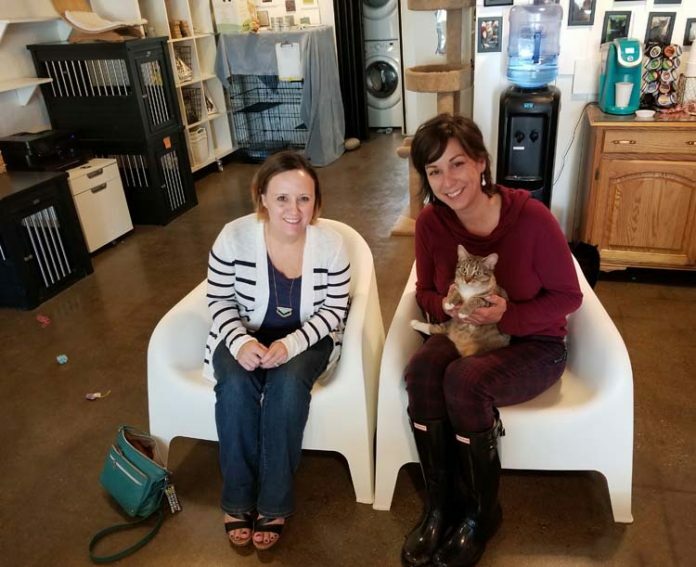 Some will even leave with an adoption application, or visit the lounge after seeing one of the many adoptable cats on the organization’s website and social media. 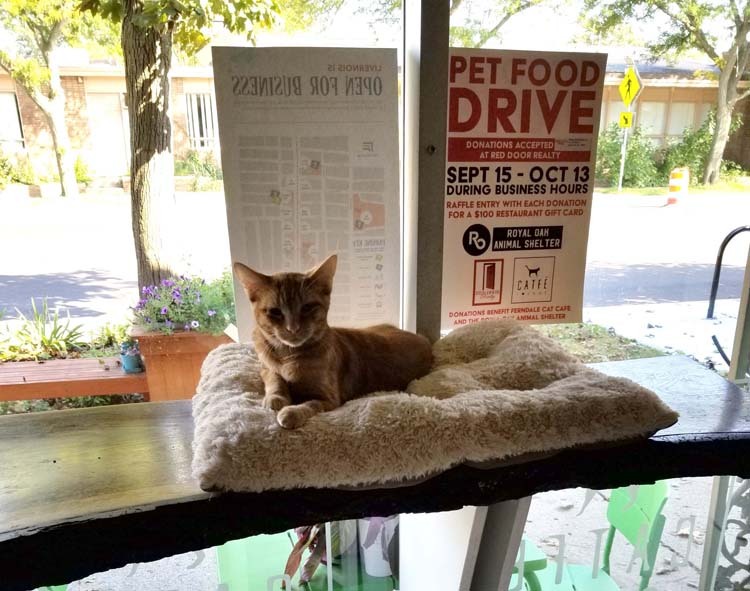 An orange tabby named chicken lounges in the storefront window facing Livernois. Naturally, kittens are always popular with the public, but FCS and other shelters like it often struggle with placing senior cats or those with disabilities. Ferndale Cat Shelter is proudly no-kill, which means cats will never be euthanized if they have access to a good quality of life through proper medical intervention and a patient owner. But finding those patient owners and caring for the dozens of needy cats in the interim — one example being six-month-old Carter, whose pelvis had been broken from abuse and needed immediate surgery — is always a challenge. That’s why FCS created the Forever Foster program, which places senior and/or disabled cats with individuals willing to care for them for the rest of their lives, but only with as much of a financial burden as they can comfortably handle. The shelter takes care of the rest, which can include anything from specially formulated food and insulin for diabetic cats to major surgeries. As it turns out, Robin Winfield, 67, was more than happy to oblige. Winfield, of Canton, first learned about Ferndale Cat Shelter through her niece, who adopted two cats there, and then her sister, who adopted yet another cat. It was while joining her sister to see the cats she liked that Winfield met Iovan, who then told Winfield about Daisy. “They showed me her picture and, oh my gosh, I just fell in love with her,” Winfield says. But she’s on a limited income and didn’t think she could afford to own Daisy, who is 12. When Iovan explained the Forever Foster program, however, “I just knew. I knew that was it,” Winfield says. Daisy had been fostered by FCS for three years at that point and was “very unhappy,” Winfield says. She doesn’t get along with other cats or lots of people, and Winfield believes she had also been abused at some point. But with FCS handling Daisy’s medical and incidental needs, Winfield didn’t feel anything but optimism at the thought of keeping her. She and Daisy have been together now for almost two months, and Daisy, who spent all her time hiding in the closet at her former foster home, now perches on the back of Winfield’s couch to gaze out the window. When she’s ready for bed, she sits in front of Winfield and stares until her foster owner gets the hint, turns off the TV, and the two of them head for the bedroom. And a couple of weeks ago, Daisy let Winfield scratch her ears for the first time. “I know there’s still a little bit of a slow road to go, but I wouldn’t give her up,” Winfield, who’s single with no children, says. 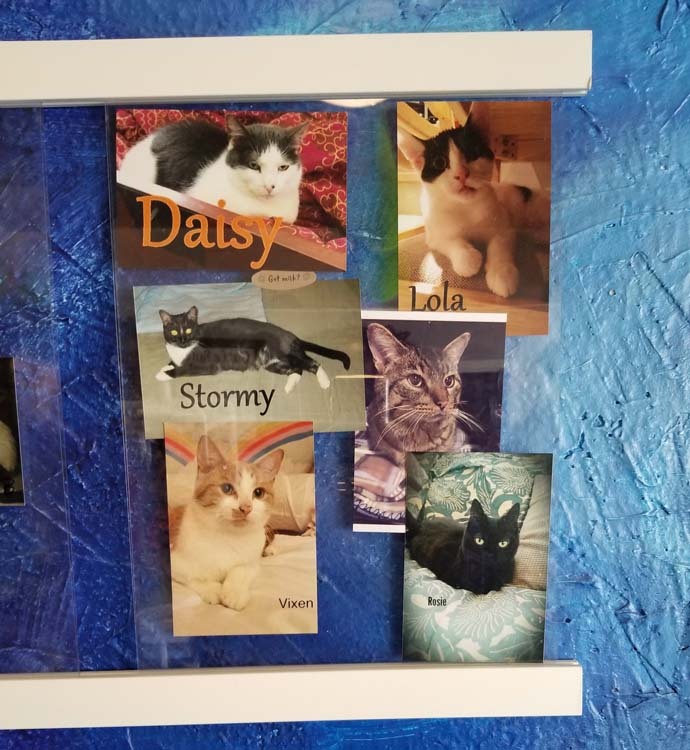 Several walls at the Catfé Lounge show off photos of animals that have been successfully rehomed, including Daisy at top left. That’s the dynamic Ferndale Cat Shelter is aiming to show off more to the public, Iovan says. In fact, she’s hoping to expand the Forever Foster program in the future by seeking sponsorships and partnering with local senior living communities that allow pets. A recently launched Indiegogo fundraiser will help support those efforts, as well as a planned expansion into a building at least twice as big as the current Catfé Lounge. With this added space, Iovan wants to open a resale shop and perhaps even offer a full-service coffee shop (kept separate from the kitties, of course) to further support the shelter’s long-term sustainability. Charm Bliss, 60, is another Forever Foster who took in 13-year-old Leyland, an orange tabby, a year ago. Leyland’s previous owner was getting married to a woman who had cat allergies and couldn’t keep him. “It’s just nice to come home and have something to hold, you know, when you’re alone,” Bliss says. 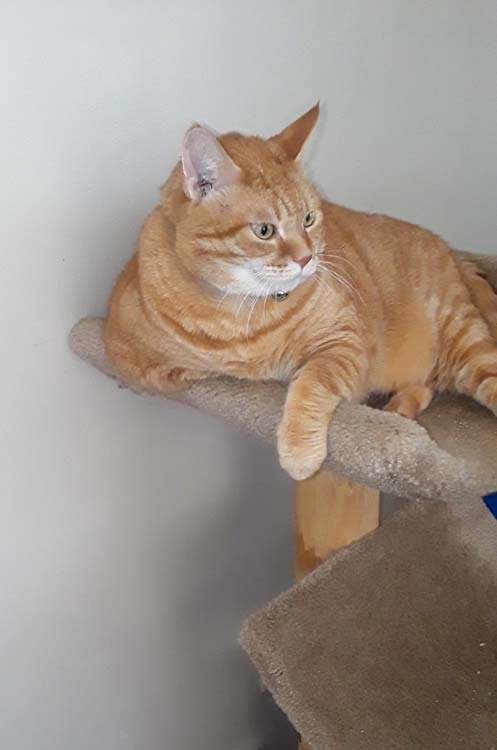 She’s on disability for back issues and works part time, so the Forever Foster program has provided community and healing for both her and Leyland, who’s overweight and has food allergies Bliss is currently helping to manage. Despite their expansion plans, both Iovan and Lynn McPherson, the organization’s foster coordinator, note a traditional shelter that can house hundreds of cats in one location isn’t on their wish list. “I think every cat is happier in a home, in a loving home, but some cats just adapt well to this scene [the Catfé Lounge] and some of them don’t,” Iovan says. Their current hybrid model helps make sure the more reclusive or ill cats get the individualized love and attention they need while the organization can maintain a recognizable — and beloved — physical presence in the community. Winfield and Bliss definitely agree. To learn more about Ferndale Cat Shelter and Catfé Lounge, visit ferndalecatshelter.org or catfelounge.com. 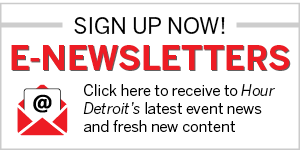 To donate to the organization’s 2019 fundraising campaign, click here.